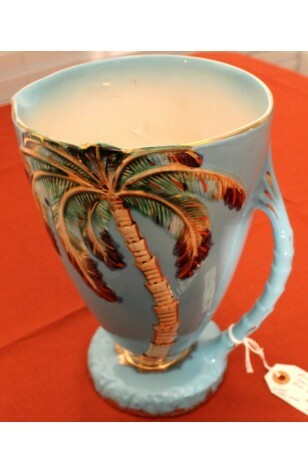 Vintage - Beswick Ware, Made in England, Large Vase with Palm Tree Pattern #1068, Circa 1936-54. This is a Large, 8" Tall, Sky Blue Vase, Made in England, by Beswick Ware, between 1936 and 1954. There is a Large Palm Tree, in Browns, Greens, Creams and Gold, climbing up the Vase.. and the Handle has the look of the Tree. This Vase is Footed, Rim is Scalloped, and Handle, Foot and Rim, are all trimmed in Gold. Vase has a very high gloss finish, and is in excellent condition. This is a Large, 8" Tall, Sky Blue Vase, Made in England, by Beswick Ware, between 1936 and 1954. There is a Large Palm Tree, in Browns, Greens, Creams and Gold, climbing up the Vase.. and the Handle has the look of the Tree. This Vase is Footed, Rim is Scalloped, and Handle, Foot and Rim, are all trimmed in Gold. Vase has a very high gloss finish, and is in Very Good Resale Condition, having no known defects.